At my first CES, one of the devices that caught my attention immediately was a slick looking single-DIN head unit running Android called the Parrot Asteroid. One of the things about Android is just how versatile the platform is and all the different places that forked versions of the OS have made their way into. It doesn't take much imagination to see how Android could be potentially disruptive in a car either as an infotainment or navigation system - media compatibility, maps, and a huge application ecosystem pretty much sell the thing. Though it's already been announced, one of the products I was most excited to play with at CES 2013 was the original Parrot Asteroid's successor and bigger brother, the double DIN Parrot Asteroid Smart. This is a head unit with 6.2-inch capacitive touch screen running a heavily-skinned and car-tailored version of Android 2.3.7 atop an unnamed TI OMAP(3, maybe 4?) SoC. For connectivity there's 802.11n (no word on 2.4 or 5 GHz) WiFi and Bluetooth 3.0 onboard, likely from some TI Wilink series combo. On the back are three USB 2.0 ports and a fourth for iPods, iPhones, and iPads with 2A charging support. The head unit has audio outs for left, right, and sub, with 4 55 watt outputs. Of course there's compatibility with GPS and steering wheel controls. The rest of the specs are on Parrot's site for the Asteroid Smart. I spent a lot of time playing around with the Asteroid Smart since this the kind of convergence device for the car that I've been wanting for some time to replace my own aging head unit. 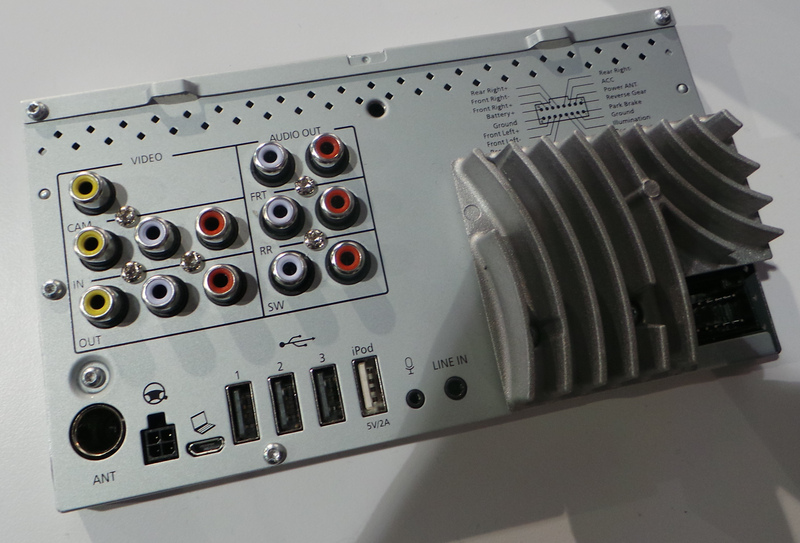 The aftermarket head unit space seems full of strange one-off OSes and platforms and could benefit strongly from a coherent platform message. The Asteroid Smart hasn't yet passed Google CTS (Compatibility Test Suite) and thus doesn't yet have GMS (Google Mobile Services) approval to use Google Apps or the Play Store, although I'm told that Parrot is working to make this happen if at all possible. In the meantime, they've created an application marketplace of their own called the Asteroid Market to showcase and sell applications designed to be used with the Asteroid lineup and the decidedly different UI requirements for a car versus a phone. The news out of Parrot about Asteroid for this CES is the unveiling of a developer portal and SDK for building apps and getting them on the Asteroid Market. I played with the Asteroid Smart a lot and came away pretty impressed with the device, though there are some caveats. All controls are exposed through the UI on the Asteroid Smart, there are no physical volume buttons or toggles, other than a power on button and faceplate eject button. There's no CD input, though I've lived without a CD player in my car with my current head unit for long enough to know that isn't impossible — instead media will come from an attached USB storage device, on an SD card, or from attached smartphone. I suppose the lack of physical buttons is mitigated by the compatibility with steering wheel buttons, but I could imagine the two-tap volume change UX to be a possible problem. Although it runs 2.3.7, the UI felt smooth and performant basically everywhere, swiping through menus, changing media, and in the custom launcher. Oddly enough Parrot has crafted a UI that looks suspiciously like 4.x atop it — I just wish it was Android 4.x to begin with instead of 2.3.7, but thankfully there's still enough application compatibility that this shouldn't be a huge problem. There's also the normal Android launcher buried inside if you look for it, along with browser and a maps application that uses Google's map tiles. Again, Parrot can't bundle the Google Maps application until they've obtained a GMS license, but for now they're getting around that by bundling a stripped down version that just uses the APIs in Android. There's also a microUSB port on the back for sideloading applications, which I'd imagine is something users would do who actually want Google Apps regardless of GMS approval. Parrot is targeting a price around 599USD for the Asteroid Smart with availability early 2013. If nothing else, this is the kind of convergence device that really interests me and seems to be a major theme of CES. We have connected cameras now, why not connected cars and head units? One big issue with this sort of haphazard slapping of Android (with a minimal skin on top) onto a dashboard is that UI integration and reduction of complexity are even more critical in the auto space than in phones. Driver distraction is a major issue, so the normal model of having screens of disparate apps that you touch, navigate through complex menus, etc. is a problem. From the video, it looks like they've loaded an iGO app for navigation, but that has nothing to do with the Google-based "Maps" app, which presumably can't do turn-by-turn directions (since it's going through the platform API). So you'd have to search, find a POI, copy the address, go home, open iGO, paste address in there, then navigate. If you want to explore the surroundings (their Wiki-connected app), you have again go home, open that, then switch back to the nav app. Not the greatest (or safest, if you're driving) idea. It's cool for a head unit to be able to do everything a phone can, but this type of platform needs a heck of lot more software work to be useful or safe. Auto OEMs' solutions lag the CE market and may seem less fully-featured than this (e.g. you can't play Angry Birds on Ford Sync), but in practice they lack some of the big safety / usability problems you'll find if you try to use this in a real car. So some parts of the UI / some applications will be locked out while you're moving. That's just like any normal head unit and just like most other aftermarket devices easily circumvented by a parking break short / cable in the chain. Most of the UI honestly looks like it has been tweaked to accommmodate the car, it isn't at all just stock Android slapped on a head unit. For example their launcher is a 3x2, most apps have big text and toggles, nav buttons on the left remain persistent everywhere, etc. I hopefully will obtain a review unit and give it a shot. Please get one, i am dying to replace the standard single head unit on my civic, with a double head one. If you get one could please test sound quality, distortion, radio signal quality, easy of use, touch screen quality, ease of installation, and the most important how hard it is to robbed from the car. 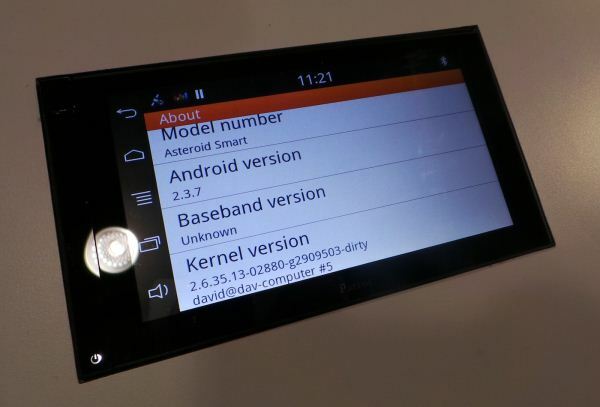 Do you know if tomtom will release their android version on this also? Seems like a lot of duplication of effort for little gain. Even if they got apps support you need to share the wireless connection from your phone to get any data to the device. Personally I think the right approach is like Pioneer was leaning toward, where you get basic music playback and radio/sat interface from the head unit, and everything else is mirrored from your smartphone. It already has all the necessary communication and information on it, and you can upgrade it far more easily than the head unit. All I want is to be able to access the music, apps, and info from my phone more easily while driving. Honestly, this doesn't hold a candle to my car-mounted nexus 7. i have jelly bean, full google nav, audio line out, and a full array of applications. I even have a nifty app that lets me task-switch by swiping 3 fingers left/right, or change tracks without looking using a 2 finger left/right gesture. the N7 fits nicely in a dual din slot. these proprietary solutions have been lagging behind for years. Why can't someone get aosp compatible internals, stick them in a dual din, and call it a day? The point with this is that it makes it easier. All you have to do is remove your stereo and replace it with this.